S.T.Dupont 5174 Cufflinks, in this palladium version, were worn by James Bond 007 (Daniel Craig) in the "Casino Royale" movie, and, more precisely, during the first meeting with Vesper (Eva Green) in the highspeed train to Montenegro. 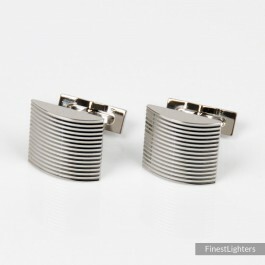 The cufflinks are finished in polished palladium (platinum) and feature a square design with curved stripes. A much sought after item by 007 lovers and collectors, discontinued years ago and completely sold out. Discontinued years ago and completely sold out.